THEREBY BE IT RESOLVED, that the Richmond College Student Government Association stands in strong opposition to the total exclusion of students from the process used to reach this decision to eliminate two Division I sports programs at the University. 4. Requests the admission of the RCSGA and WCGA Presidents as student-trustees with full voting privileges at all Executive Committee Board of Trustees meetings. Moyer, Erin. 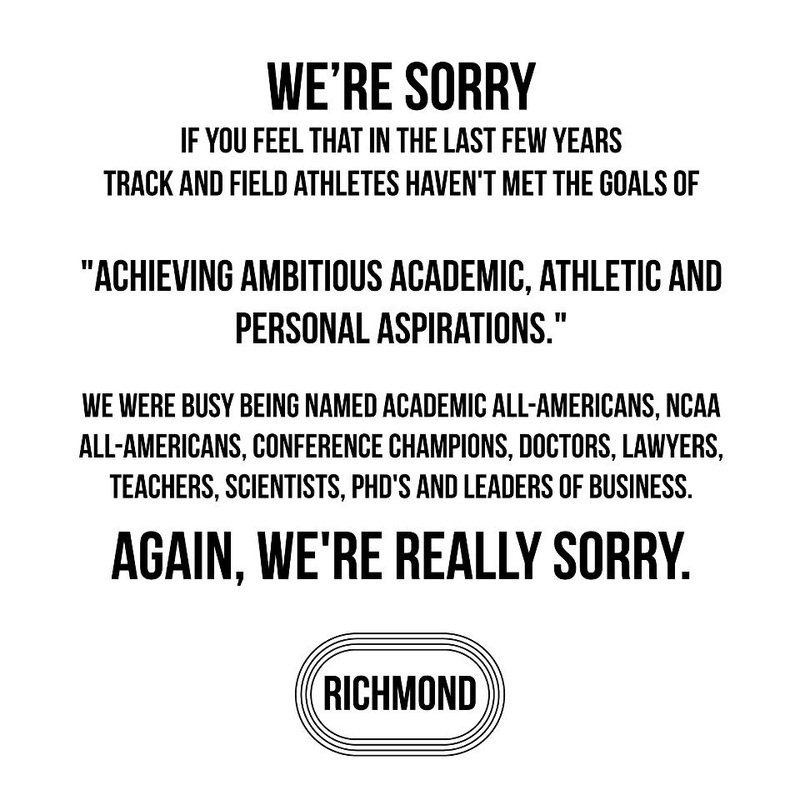 "Richmond Community Unites in Effort to 'Save Our Sports'" The Collegian. University of RIchmond, 1 Oct. 2012. Web. 31 Oct. 2012. <http://thecollegianur.com/2012/10/01/richmond-community-unites-in-effort-to-save-our-sports/29107/>. Woody, Paul. "Trustee's Decision Leads to UR Feud." Richmond Times-Dispatch. Richmond Times-Dispatch, 2 Oct. 2012. Web. 31 Oct. 2012. <www2.timesdispatch.com/sports/sport/2012/oct/02/tdsport01-trustees-decision-leads-to-family-feud-a-ar-2250248/>. "Frequently Asked Questions on the Addition of Men's Lacrosse and Changes in the University of Richmond Athletic Program." Richmondspiders.com. University of Richmond, 9 Sept. 2012. Web. 31 Oct. 2012. <http://www.richmondspiders.com/ViewArticle.dbml?DB_OEM_ID=26800>. The alumni of the recently cut Richmond men’s soccer and track and field teams have continued their strategic planning efforts, with large parts of those efforts culminating right before Homecoming Weekend. In the paper, the alumni highlight why outdoor track should be reinstated, citing sources for all research and claims, while indoor track and soccer should be given an opportunity to raise the funds needed to remain along with the addition of a women’s sport. Ayers did not respond to an email request for comment on the paper, and Miller responded that he had not had a chance to look at it yet. The men’s soccer alumni have also noted some contradictions. On Wednesday, soccer alumni published “8 Easy Steps to Establishing a Varsity Lacrosse Program” onto their website, carrytheflag.weebly.com, under the tab, “Web of Deceit.” This publication will serve as a prelude to a Carry the Flag press conference, headed by soccer alumnus Scott Byrnes, a 1991 graduate, at 1 p.m. on Friday in Room 120 of the Jepson School of Leadership Studies. Byrnes said he had heard other alumni say soccer and track alumni had been overreacting. The press conference has been moved around numerous times during the past two weeks, Byrnes said. The reason for the delays was because the alumni were waiting for an article in The Washington Post to be published that would disclose a lot of the information that will be revealed on Friday, he said. Because the reporter was offered an exclusive story, the alumni made a commitment to not reveal any information in a press conference before the paper broke the news, Byrnes said. Byrnes said he and the other alumni could not wait any longer because track and soccer team members were evaluating transfer options. “We have a strong suspicion that the article has been squashed by the very people that we’re up against,” he said, but didn’t have any evidence to back up that claim. The conference was postponed again because Byrnes was told that there would be a Board of Trustees meeting on Thursday, and he hoped the Board members would reconsider and reinstate track and soccer at that time, he said. The secretary to the board was unable to be reached for confirmation of this meeting. Junior Amanda Lineberry, a student representative for academic affairs and enrollment management, who is present at four board meetings per year, said that if there was a meeting scheduled, student representatives had not been invited. Yesterday, the members of the Richmond College Student Government Association approved an official resolution about student involvement in decision-making at the university drafted by freshman senator Harry Lambert. The resolution expressed RCSGA’s strong opposition to the exclusion of students from the decision to eliminate the sports and recommended greater transparency and student representation at Board meetings in the future. In the soccer alumni’s “Web of Deceit” post, Richmond’s Vice President of Advancement, Tom Gutenberger, was mentioned for the first time in association with the sports cuts. Gutenberger did not immediately respond to a request for an interview after a message was left with his secretary. The post states that members of the soccer alumni steering committee met with Gutenberger last spring, one month after this decision to cut soccer was apparently made, to talk about designs and costs for an on-campus soccer stadium. Gutenberger was also a member of the sports mix committee that recommended these changes, Byrnes said. Gutenberger has since not responded to questions from alumni regarding the matter, Byrnes said. The formation of the track and field paper — headed by Molz, Jim McKeon (’85), Matthew Blanchard (’95), Andrew Blanchard (’97), Seann Mulcahy (’04), Neil Slotterback (’08), Michael Stubbs (’08) and Andrew Benford (’11) – hoped to provide a better solution, Molz said. One argument made in the paper is that the termination of the outdoor track program has nothing to do with the addition of the lacrosse program. It also explains why the cross-country program will suffer without a supplemental track team. The paper also includes criticism of the athletic department having made the decision without knowing specifically where the 20 extra spots would be allotted. Other points made in the paper include: disparaging Ayers’s claim that the university’s makeup of 13 percent in all incoming classes is the highest among schools we compete with for students; why the cuts are just a loophole and not in the true spirit of Title IX, and how that reflects badly on the school’s image, and the poor precedent this decision is making on the world of college lacrosse. The track and field paper can be found on the wearerichmondtrackandfield.org website. Song List for "Carry the Flag" Supporters Section during UR vs. VCU game on 11/2 @ 7:30 P.M.
And that’s the way we like it, we like it. Oh to be a Spider! I moved my family several years ago to Richmond from DC. We have supported U of R through the years and have made many friends with ties to your school. We attend many sporting events with our 3 kids. No more if you continue with your plans to drop the most popular youth sport in the US. I currently run 3 companies here in Richmond and employ several UR alumni. All are very disappointed in your decision and inability to provide a reasonable explanation. Reeks of UVA's recent debacle (my alma mater). Good luck over the next year. I hope you relax your stubborn stance for the benefit of your school. No company ever downsized its way to greatness. While this quote originated in the context of corporate restructurings in the 1990’s, I firmly believe that it is applicable to higher education and intercollegiate athletics. I write today to add my name to the list of alumni, parents and current student-athletes voicing displeasure with Friday’s announcement regarding the soccer and track & field teams. Before I criticize the decision, I should begin by praising the work of Steve and Lori Taylor. Since their arrival, the cross country and track & field teams have been on a steady upward trajectory. Their tireless devotion to the young men and women of the University of Richmond represent what’s best about intercollegiate athletics. Their passion and commitment to excellence are reflected in the outstanding conference, national and international results achieved by the teams in recent years. The remarkable student-athletes they recruit serve as wonderful ambassadors for the athletic department and the university as a whole. The university is incredibly fortunate to have had them as coaches. 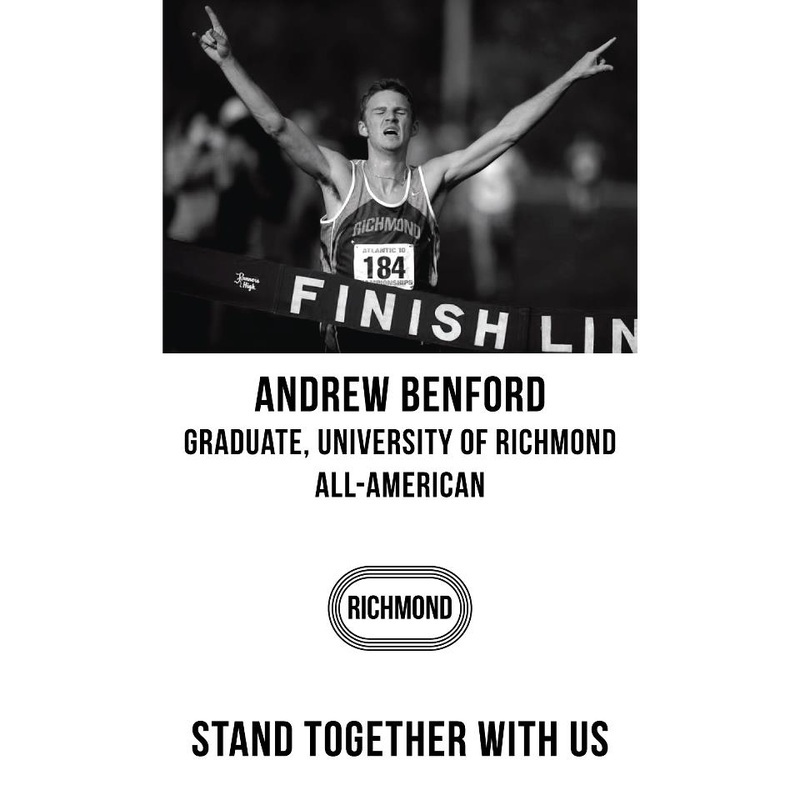 During the past year I have had the pleasure of attending University of Richmond football, baseball, basketball and soccer games and a track & field meet with my two young sons. Now, when we play in the back yard I’ll have to inform them that their dreams of becoming the next Kevin Anderson or Mike Mergenthaler will have to suffice, as their dreams of becoming the next Andrew Benford, Matt Llano or Ben Brewster were unceremoniously put to rest on Friday. In addition to working on their jump shots and pitching mechanics, we’ll also have to spend time each afternoon learning and discussing terms like “existing resources,” “endowment funded by multiple donors,”[i] “reconfiguration,”[ii] “strategic plan” and “board of trustees.” So much for the simplicity of youth and sport. Some may find a way to fashion a defense of the substance of the recent decision using tortured logic and selective statistics. However, I can’t imagine anyone coming to the defense of the callous timing of Friday’s announcement. I recognize there is never a good time to deliver bad news, but telling young men in the middle of a season (and on a game day for the soccer team) that the sports they have devoted themselves to are no longer needed because a few people wrote large checks to the university is particularly heartless. Sparing the cross country team the chopping block was perhaps the most curious part of the decision. Would you have considered eliminating the swimming team in all strokes except for butterfly? (I realize that is a poor example since the men’s swimming team was cut years ago.) Instead, would you have considered telling the tennis team they would no longer be needed for singles competition but they would be expected to continue to show up and represent the university in doubles play?